At the ICCAT Commission meeting in 2009 a proposal to implement mitigation techniques to protect seabirds was not adopted as consensus was not reached. The Commission for the Conservation of Antarctic Marine Living Resources (CCAMLR) has introduced measures which have considerably reduced by-catch of albatrosses and petrels in long-line fisheries around South Georgia (near the Sandwich Islands) by 99%. Recently, other Regional Fisheries Management Organisations, including tuna commissions, have also taken important steps to reduce seabird by-catch. 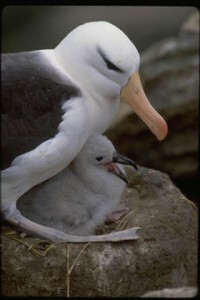 As no single mitigation measure can be reliable the 2011 proposed ICCAT agreement would require the compulsory use of two out of the following three mitigation technologies: Firstly, the streamer line (tori line or bird scaring line) used to deter the albatross and other seabirds. Secondly, weighted branch lines to sink hooks more quickly out of reach and lastly, night setting, when seabirds are generally not feeding. Albatross and petrel greatest distribution area are in the Southern Hemisphere, where species such as the grey petrels (Procellaria cinerea), white chinned petrels, speckled petrels range as well as black-browed albatrosses (Thalassarche melanophris) and wandering albatrosses range. The joint Contracting Party, proposal would be implemented in the zone below 20° south, for the compulsory deployment of the mitigation measures targeting swordfish, albacore and bigeyed tuna. Long-line fishing is the main cause of the decline of the wandering albatross (Diomedea exulans) the last population estimate was 26,000 individuals, as their name indicates their distribution area covers a large area around 64,700,000 km2 mostly in the Southern Hemisphere. For some sub-populations it is estimated that even low incidental catches are likely to result in serious impacts. As an initial step, Robin des Bois underlines the urgent need for ICCAT to reach consensus on protecting the albatross and petrels and that the mitigation measures should be applied in all areas south of 20°S. This agreement would concern the distant long-line fleets such as Japan, Taiwan, Korea as well as Spain and Uruguay. If ICCAT does not react now some of these mythic seabird species could become a myth. The proposal should be addressed on Thursday by the ICCAT Commission.